Now, more than ever, marketing companies and consultants need to get competitive for client dollars and what better way than advancing your knowledge and your network? 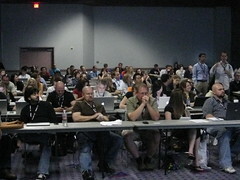 There are many options for companies and agencies to train digital marketing teams and to keep tenured employees up to date including conferences such as: this week’s WebmasterWorld Pubcon, Search Engine Strategies, Search Marketing Expo, numerous regional and niche events and an increasing number of web based offerings including SEMPO Institute and the DMA Search Engine Marketing Certification program. I would be remiss not to mention the upcoming “Social Media Smarts” workshop in NYC covering all aspects of social media marketing including a strategy exercise and tips on building a business case for a social media effort in your organization. Attending conferences is not cheap when you factor the increasing price of travel and hotels as well as pre/post and conference training fees, meals and taxi. Attendees and their companies are paying $2500 – $5000 per person per conference as well as the cost of time away from the office performing billable work. It’s easy to see why webinars are on the increase and why those who are fortunate to attend these events need to get the most out of them. 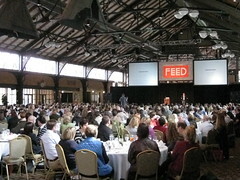 The most important thing that conference attendees can do to get the most out of their time at events is to set goals. Managers sending individuals to conferences should be clear about expectations. Company staff should be sure to talk with others within the organization or team that have attended the same or similar events to gain their insight. Knowledge – How many sessions will you attend and how will you capture the information? Notes, photos, video (where allowed) When meeting new people, discuss the sessions with them. Compare notes with other attendees, it’s a great way to network and to get other opinions. Before the conference, make a grid or a plan for which specific sessions you’ll be attending. 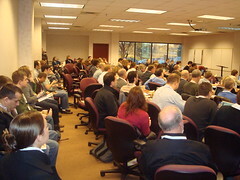 Often times, there is not much time between sessions and the difference between getting a good seat and standing room only can be a matter of minutes. Networking – How many qualified prospects, marketing partners, vendors to outsource to and job candidates will you meeting? Each day, tally them up and plan how you will follow up. Content – how will you leverage your conference experience to create new content for your company blog, articles, or process documentation? Set goals for how many you’ll create each day. The content you capture and create can supply a company blog with numerous posts and show clients, staff and prospective clients that you are on top of what’s happening in the industry. At TopRank, our staff are required to publish at least 3 blog posts for each day of conference attended. Set goals for how many blog posts, articles or other types of content will be created each day of the conference. It doesn’t have to be all text, you can take photos of people, and presentation slides. Take videos where allowed. Knowledge transfer – How will you pass on the information youâ’ve acquired to the rest of the team? At TopRank Online Marketing, our staff take the highlights and any specific tactics of use and create presentations which they share with the rest of the TopRank team. Knowing you will be required to present the information you are gaining with the team back at the office helps focus on takeaways and practical interpretations of the new information. Socialize – Where there’s a conference, there’s a party. After hours events are exceptional opportunities for conference attendees to relax, network and share information. Make no mistake, post session networking can be an art form. Make a point to relax and have fun, but be clear about objectives and make a goal of attending a dinner each night of the event if possible. Some dinners are a tradition amongst long time friends, some are sponsored by vendors and some are at hoc events that occur as a result of like minded individuals wanting to continue the day’s discussion. As you can see, there are many more opportunities to get value from marketing conference participation than keeping up to date with an industry. Pre conference goal setting and planning, well defined processes as well as follow up and post event knowledge sharing can all multiple the value organizations realize by sending employees to educational events. Not all organizations are positioned to take full advantage of these insights, but through simple analysis, it can become clear pretty quickly how much is being left on the table or to competitors who are sending the same numbers of people and incurring the same costs. Understand the conference offerings, set goals and make the time to pre-plan conference involvement. 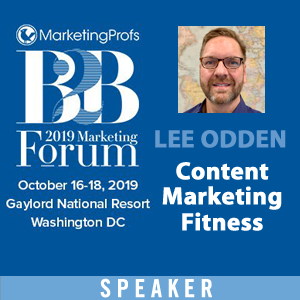 Leverage content creation, networking, recruiting, competitive intelligence as well as prospecting opportunities and industry conferences can move pretty quickly from an expense with an uncertain effect to an investment with multiples of return. Lee, the timing and the positive voice of this post is excellent. As an exhibitor and sponsor our costs are also very high and we need to have better goals and ways to achieve them as well. Thanks Mario, you bring up a very good point that I did not mention in the post – the perspective of the exhibitor. TopRank doesn’t exhibit at conferences, but I bet a post specific to exhibitors would be a great idea. Many of us are preparing for next year, give us your thoughts.